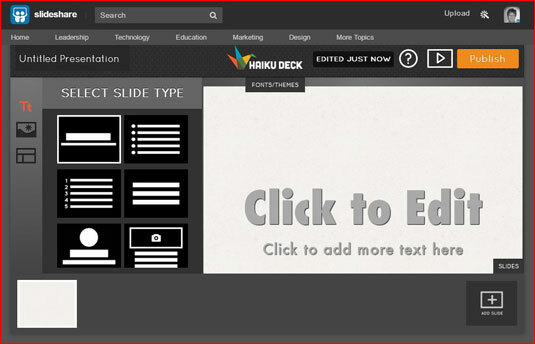 From the SlideShare Home Page, on the top right side of the screen, click the writing wand next to your profile picture. You are presented with a blank presentation. Explore what you can create with a blank presentation. 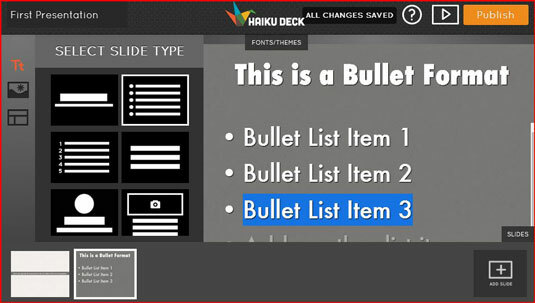 Name your presentation using the Deck Title function. It’s a good idea to name your presentation before doing anything else to your slide deck to ensure that none of your information is lost. After you have named your presentation, you should title your presentation. 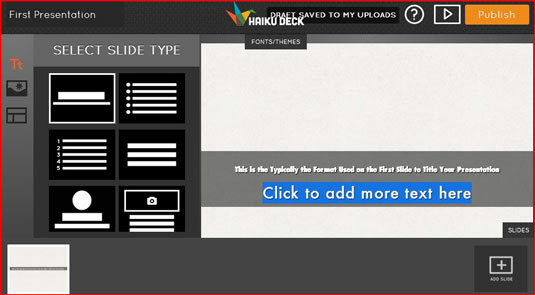 Click the Add Slide button, choose a new slide format and add your content. You can continue to save, re-open and edit your presentation until you are ready to publish it. When your presentation is published, you can no longer edit it; however, you can delete it and start over again. Click the Publish button, and your slideshow is ready for viewing. Edit: Change the name of your presentation, add a long description, add tags to facilitate searching, apply a category where your presentation will be stored for others to view, choose a different language, apply a player background, and choose a copyright license type. Privacy Settings: Apply Public or Private privacy settings. 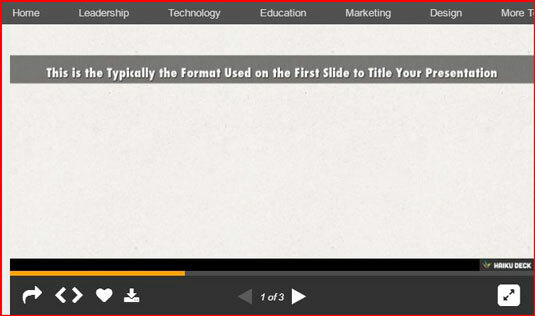 Edit YouTube Video: Insert YouTube videos in your SlideShare presentation. Analytics: Where you can see how many times your presentation was viewed. Re-Upload: You can upload a new file. When re-uploading a presentation, your current SlideShare will continue to display until the new file uploads successfully. All existing data (comments, views, tags, etc.) will remain when your file is replaced.